David Chase (born August 22, 1945) is an American screenwriter, director and producer. He is best known for creating the HBO drama television series The Sopranos (1999–2007). The show became very popular and earned him seven Emmy Awards. He has also produced and written for shows such as The Rockford Files, I'll Fly Away and Northern Exposure. He will serve as an executive producer and writer of the future movie The Many Saints of Newark, a background story to The Sopranos. Chase was born in Mount Vernon, New York to an Italian American family. He married Denise Kelly in 1968. They have a daughter, Michele. ↑ Fleming Jr., Mike (March 8, 2018). "David Chase Revives 'The Sopranos' With New Line Prequel Movie 'The Many Saints Of Newark'". Deadline Hollywood. Retrieved September 12, 2018. ↑ "The man behind The Sopranos is whistling a new tune". The Globe and Mail. January 12, 2013. Retrieved December 13, 2017. 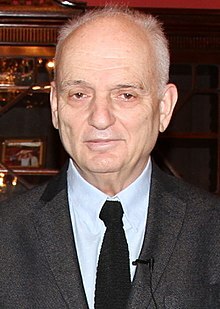 Wikimedia Commons has media related to David Chase. This page was last changed on 31 January 2019, at 05:47.